According to a recent report by the U.S. Bone and Joing Initiative (USBJI), an estimated 126.6 million Americans, and one in two adults, has a musculoskeletal condition. That's more than double the amount of Americans living with chronic heart and lung conditions. Musculoskeletal conditions affect bones, joints and muscles, and are often very painful and debilitating. Diminished daily quality of life, decreased mobility, and even reduced productivity-due to lost time at school or work - are also unfortunately typical. The USBJI reports that nearly $213 billion is spent each year for treatment, care and lost wages of those suffering from a musculoskeletal condition. The average annual cost per person for treatment is upwards of $7,800. The most common conditions are arthritis; back and neck pain; injuries from falls or sports; and osteoporosis, a loss of bone density affecting both men and women. Arthritis is the most common cause of disability, with half of all U.S. adults age 65 and over suffering from the disease. Two-thirds of arthritis sufferers are actually under the age of 65. Osteoporosis affects 10 million Americans, with an estimated 19 million more currently at risk. One in two women, and one in four men, age 50 years and older, will suffer an osteoporosis-related fracture. Twenty percent of hip fracture patients, over age 50, will die within one year of the injury. In order to help ease the burden of musculoskeletal conditions on patients, the medical community, and the economy, the USBJI recommends educating about the importance of behavior change in prevention and treatment (such as with weight management and other precautionary measures taken in daily life). Also, improved coordination between primary care physicians, orthopedic specialists, physical therapists, and chiropractors could be instrumental in lessening the impact felt by so many dealing with these disorders. If you or a loved one is suffering from a musculoskeletal condition, contact us for an appointment. Most of us lead very busy, fast-paced lives crammed with family, professional, and social obligations, yet we remain largely sedentary according to recent research from the U.S. Bureau of Labor Statistics. Whether it's sitting down at work for extended periods of time, or sitting in a car shuttling from one activity to the next, we are sitting still. A lot. Though it has long been proven regular exercise and physical activity are highly beneficial to your health, including the prevention of heart disease, diabetes, and some kinds of cancers, it can be challenging to fit into a hectic schedule. ﻿Start with the leg at a 90-degree angle, extend it until straight, then squeeze and hold the leg extended for ten seconds. Slowly lower the leg to starting position, and repeat up to ten times with each leg. Bend both arm at your side to a 90-degree angle. Alternating arms, rotate your shoulder but keep your elbow planted into your side for resistance. Perform ten reps with each arm. Sit up straight, and engage your abdominal/core muscles by crossing and then raising your arms in front of you. Rotate at the waist from right to left to complete one repetition. Work up to at least 20 reps at a time. Hold your back straight against a chair or wall, and rotate the pelvis back, tucking it under and releasing tension in the lower back while tightening the abdominal muscles. Next tilt the pelvis forward and repeat. Hold each position for three seconds, and do this ten times. Lacrosse has become an increasingly popular sport here in Austin. It is played right now during the spring season by both boys and girls, and by people of all ages. Many local middle and high schools have adopted lacrosse programs, and there are numerous club teams popping up all over. It is a highly fast-paced game involving speed and skill to pass the ball between fellow players' sticks and hopefully deposit it in the net! 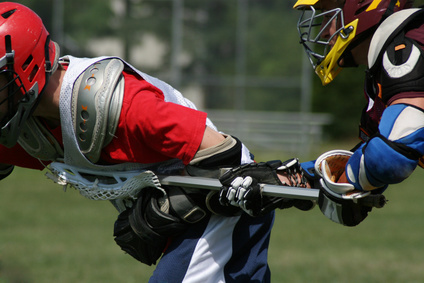 While the injuries associated with lacrosse are often less serious than those suffered in full contact sports such as football and hockey, they do happen. Ankle sprains account for 21% of all reported injuries for girls and 16% for boys at the scholastic level. In addition to sprains and strains, other common lacrosse injuries include anterior cruciate ligament (ACL) tears, shin splints, bruises, and blisters. Overuse injuries are also possible due to the repetitive nature of slinging the stick back and forth over your shoulder. Lacrosse has very specific rules on contact that differ for boys and girls. Make sure you, or your child, coaches, and officials know and enforce them. Discuss with your organization what happens if a player is injured on the field. Do you have proper ice/heat therapy, bandages, and splints or graces at the ready during each game if someone is hurt? Do you know where the nearest emergency room is located? Warm up before practice and games. This is true of any sport, but especially so with lacrosse where quick sprinting up and down the field can take a toll on your body if you are not properly loosened up. Protective equipment should be sized properly and in good condition. 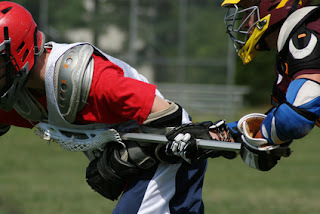 Typical lacrosse equipment includes eye goggles (girls), helmets (boys), mouth guards, gloves, and elbow or shoulder pads. Take a break of at least a day or two between games and make sure to rest sufficiently when your muscles/body are sore. Also avoid playing back-to-back seasons and for more than one team at a time. If you, or your child, suffer an injury while playing lacrosse, seek medical attention immediately or do so if the pain does not subside within a few days. The stage is set for the best players in the world to tee off right here in Austin this week at the World Golf Championships - Dell Match Play, at the Austin Country Club (March 23-27). Among the 64 top players expected to compete are Rory McIlroy and Jim Furyk. Although golf is often considered to be a low-risk sport with little chance for injury, it is a game requiring a great deal of skill and precision to make shots that can take a toll on your body. Most injuries tend to result from the "overuse" of certain joints or muscle groups when swinging the golf club. Common injuries include tendonitis and carpal tunnel syndrome. Low Back Pain: sore or tight back due to the great pressure put on the spine and back muscles from the twisting motion of a golf swing. Rowing drills are easy to do with rubber tubing, or an elastic exercise band. Place it around something at shoulder height (such as a door hinge), stand with arms straight out in front, and then slowly pull the tubing or band toward your chest. Release and perform three sets of ten reps.
Golfer's Elbow: an inflammation of the tendons linking forearm muscles to the inside of the bone at the elbow causing pain and tenderness. Squeezing an old tennis ball for five minutes at a time, at a steady, constant rate. Performing wrist curls with a lightweight dumbbell, working up to ten repetitions on each wrist. Yoga and pilates are excellent at building core strength and fostering greater balance and flexibility - all things that can benefit your golf swing and help protect your back. Also, in golf it is important to continually be aware of your surroundings on the course and your proximity to other players. It is easy to suffer an injury unexpectedly from being hit by an errant ball or swinging club. If you are experiencing frequent pain due to a golf injury, contact us. March is here and basketball fans are rejoicing. This month marks the start of the NCAA's Final Four Basketball tourney with first round games beginning on March 17. March Madness, as it's known, is one of the most popular sporting events of the entire year. Basketball is a symphony of skill and effortless gliding up and down the court by lean and lanky players, but sometimes even the most talented players can suffer an injury. 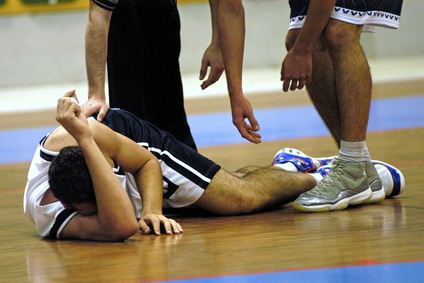 The U.S. Consumer Product Safety Commission reports there are approximately 500,000 basketball-related injuries treated in hospital emergency rooms each year. Make sure you are in good physical shape at the start of the season. Practice aerobic strength training and flexibility exercises in the off-season. And, always stretch and warm up every time before you play. Focus on just your position instead of carrying yourself all over the court, and know where other players are to reduce the chance of collisions. Choose basketball shoes that fit snugly, offer ankle support and are non-skid. Use protective knee and elbow pads along with a well-fitted mouth guard, and safety glasses if needed. If playing outdoors, courts should be free of rocks, holes and other hazards. Indoor courts should be clean, free of debris, and have good traction. Baskets and boundary lines should not be too close to walls, bleachers, or water fountains, and goal posts should be padded. Avoid too much OT (overtime). Try not to play the game so much beyond regularly scheduled practices and games that you set yourself up for an overuse injury. 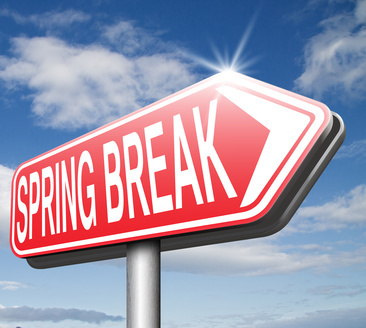 Take a break of a day or two between games, if possible, and definitely between each season. Playing the same sport in back-to-back seasons can be damaging to your muscles. Alternating sports and activities gives your body a chance to rejuvenate and can help you become a more well-rounded athlete. Have you ever wondered why the bubbles in the much-loved Guinness brand beer flow in a downward direction before settling back up at the top? Mathematicians at the University of Limerick (Ireland) discovered this was due to the unique shape of the pint glasses the beer is so often served in. Slainte, pronounced (slahn-chuh) is an Irish toast for good health, similar to our "cheers"
So, slainte, from all of us at Texas Orthopedics! 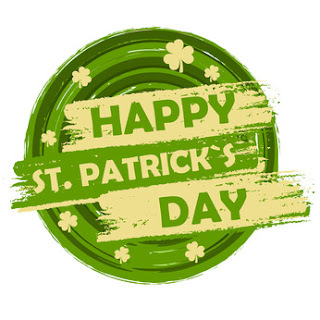 We wish you a safe and happy St. Patrick's Day! Dr. Bergin on KVUE-TV: Why Women Should S.L.A.M. 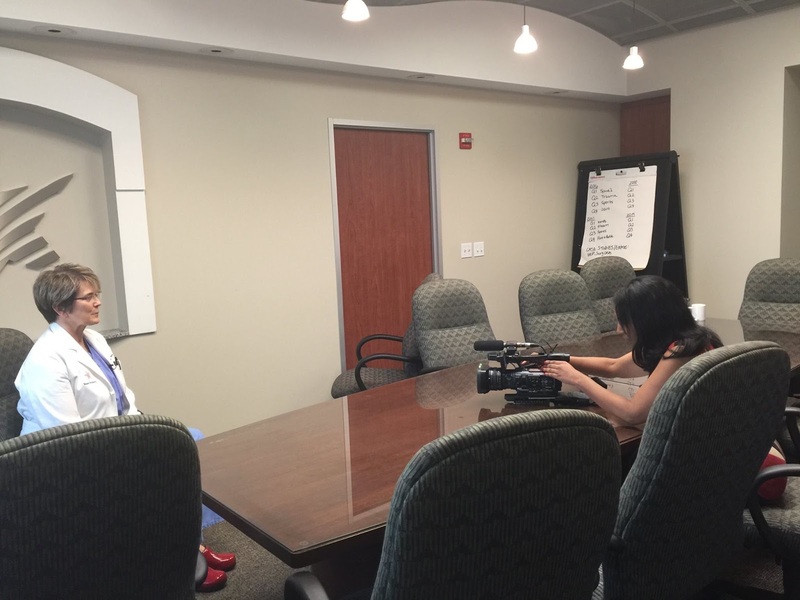 Dr. Bergin and one of her patients was recently featured on KVUE-TV about S.L.A.M., a concept she developed based on a very real problem she has noticed in three decades of practicing medicine. It stands for 'Sit Like a Man'. About 90 percent of her patients with pain under their knee caps for along the outside of their hips are women, including Cherie Hall. Hall told KVUE, "The pain was so excruciating, so bad that I almost feel like I am tired of living," she said. "It was here, all the way into the lower back and hamstring." Dr. Bergin explained how the 'lady-like' way of sitting can wreak havoc on some women. But most importantly, she demonstrated how you can S.L.A.M. to avoid these aches and pains. Click here to see the entire story. Alcohol can impair your judgment and actions and lead to a host of other issues like dehydration, nausea, vomiting, and passing out. And as always, don't drink and drive. Know your destination...are vaccinations required? Are there any travel restrictions or severe weather situations on the horizon? Be prepared for all of these things, and anything else that may come up, especially if traveling abroad. If you will be partaking in a high-risk activity, like skiing or scuba-diving, make sure your gear is good. Ensure that all equipment is in decent condition and proper working order, and also that you know how to use it. Consider taking a class beforehand if you will be trying out something new while on vacation. 4. Know the ropes...in the water. When swimming or boating, especially if you have not been in the water for several months, know what's expected and what you can do to prevent injury or death for yourself and others. Wear life jackets, or other personal flotation devices, as required, and be aware of any weather warnings if near a natural body of water. Also avoid alcoholic beverages, and pay special attention to any children who are with you to make sure that they stay safe. 5. Slather on the sunscreen. The hot sun feels great after months of the cold winter, but exposed skin that has not been outdoors for a while is very vulnerable to burning. Sunburn can lead to premature aging and skin cancer, and can make for a miserable vacation. Even when you are in the snowy mountains, always wear sunscreen with at least SPF 15, and reapply it often. Arthritis of the knee affects approximately half of all Americans over the age of 60. When non-surgical treatments (like injections, weight loss, physical therapy, and non-narcotic medications) aren't helpful in treating the painful symptoms associated, total knee replacement (TKR) is often a good option. According to a recent review in the Journal of the American Academy of Orthopaedic Surgeons (JAAOS), a team-based care approach (including the patient, family members, orthopaedic surgeon, and other medical practitioners) on TKR, along with newer pain management practices, lead to a better outcome. Managing the post-surgical pain is arguably the key to postoperative mobility, and reducing medication side effects, thereby increasing patient satisfaction. Typical pain management following surgery includes a computerized pump called the patient-controlled analgesia (PCA), with or without an epidural, which can cause nausea, vomiting, urinary retention, low blood pressure, constipation and itching. And never underestimate the importance of a strong support system, such as friends and family, in helping a patient to achieve a speedy and successful recovery.